About three hours leisurely walking. 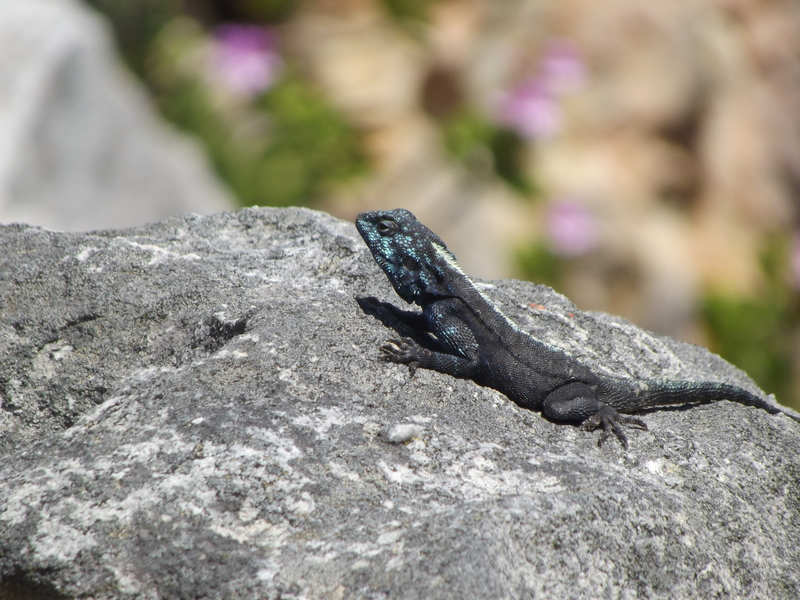 This sea level, six kilometre (three and half mile) trail along the Betty’s Bay coast starts at Jock’s Bay and ends at Stony Point and takes about 3 hours at a leisurely pace. The Denis Heesom Trail takes hikers along rocky shores, past coastal thicket with its iconic milkwood trees and through Cape seashore vegetation, famous for its succulents and, in September, carpets of flowers. 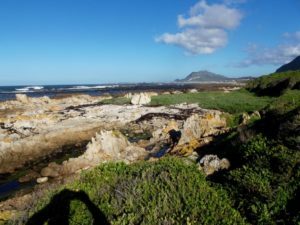 The trail crosses the mouth of the Dawidskraal River (ankle deep), and wends its way along a wide, long, white beach, past rock pools rich with intertidal life to the Stony Point seabird breeding colony, famous for its African Penguins and several species of Cormorant. 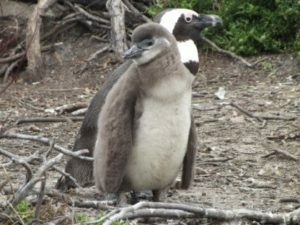 Stony Point is one of only two mainland based African Penguin breeding colonies in Southern Africa. 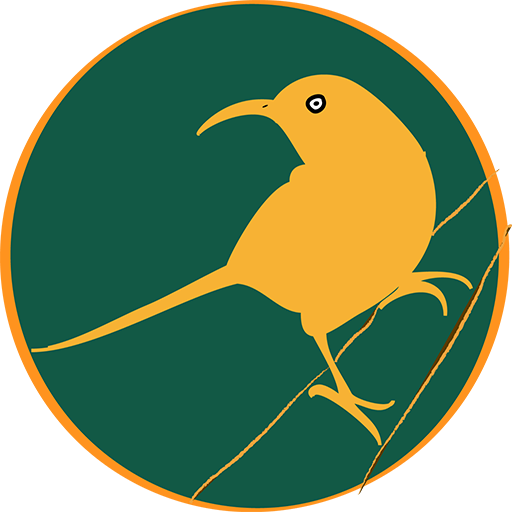 Other bird life along the trail includes Hartlaub’s Gull, Kelp Gull, Swift Tern, the near threatened African Black Oystercatcher, Sacred Ibis, White fronted Plover, Little Egret and more. Cape Clawless Otters are sometimes seen at the mouth of the Dawidskraal River. Occasionally Cape Fur Seals haul out on the beaches, sea shell strewn coves and rocky shores on this trail. A well-run, community-operated restaurant called ‘On the Edge’ offers hikers well-earned refreshments and houses an information centre describing some of the coastal and marine life in the area and the history of the whaling station that operated from Stony Point a hundred years ago. The trail, taken at a leisurely pace that allows time for bird watching, flower identification, exploring rock pools and enjoying unspoiled, coves, rocky shores and beaches, takes about three hours. No fee payable for access to the trail. Not included: R15 each including children for entrance into the African Penguin breeding area. Five to six hours of moderate to easy walking. Starting at Oudebosch in the Kogelberg Nature Reserve, the Palmiet River Trail follows the banks of the beautiful Palmiet River upstream between towering mountains, through mountain fynbos and riverine vegetation, deep into the unspoiled Kogelberg Nature Reserve. The altitude gain is very slight, making for effortless walking. 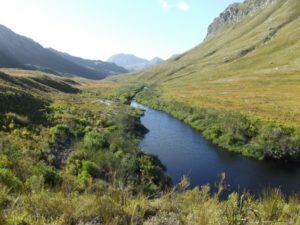 The ‘out and back’ route allows hikers to choose how far they want to go, although ten kilometres (just over six miles) out and back is about right. A fitting destination is a stunning swimming spot called ‘The Beach’ where a bend in the Palmiet River has created a sandy beach beside an expansive natural pool gently fed by sparkling rapids. This is a wonderful spot to stop, pull out a picnic, plunge into the mountain pool, absorb the stillness and feel as if they are the only people on the planet, completely surrounded by natural beauty. It’s up to the walkers and hikers to decide how long to laze on ‘The Beach’, swim and picnic before starting out on the return journey which offers new views and an opportunity to get acquainted with a dazzlingly diverse array of flowers. To truly enjoy this easy hike, allow about six hours. Sturdy hiking shoes or hiking boots, sunhats, swimming costumes and clothing suitable for changeable weather as well as water, drinks and trail food are essential. Three hours of easy to moderate mountain walking. Leopard’s Kloof is justly a favourite. 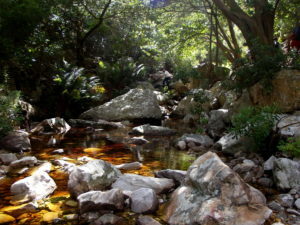 Entirely within the Harold Porter National Botanical Gardens at Betty’s Bay, this trail takes walkers into a completely natural Afrotemperate forest, enclosed on either side by sheer sandstone cliffs. 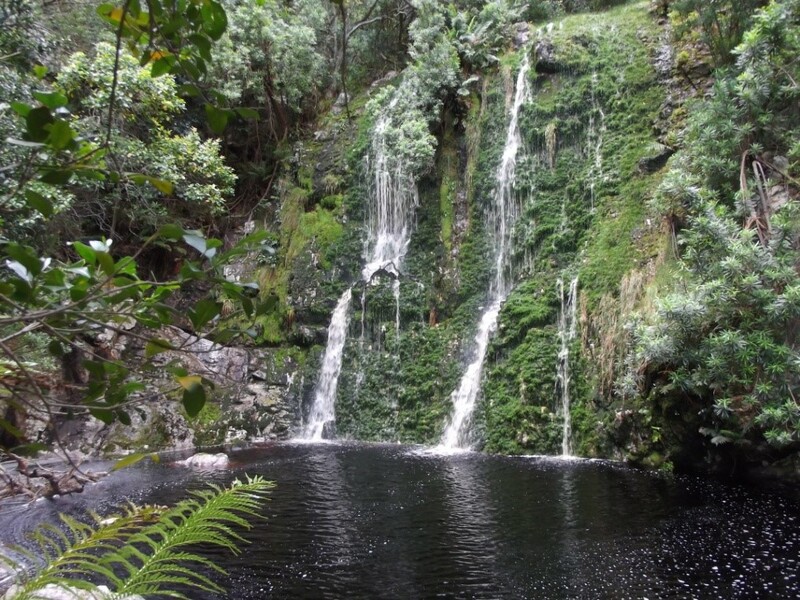 The trail crosses the whisky coloured stream of the Leopard’s Kloof River several times, passing a series of exquisite waterfalls. Almost entirely under the forest canopy all the way, walkers hear constant birdsong to the background sound of the bubbling mountain stream. Forest ferns form the understory while iconic Afrotemperate forest trees such as Yellowwood (Afrocarpus and Podocarpus species), Cape Beech, or Kaapse Boekenhout (Rapanea melanophloeos), Cape Holly (Ilex mitis), Silky bark, or Sybas (Maytenus acuminata), Cape Saffron (Cassine peragua), Red Alder, or Rooiels (Cunonia capensis) and more tower overhead. 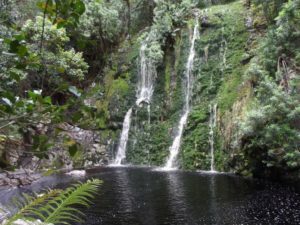 The trail reaches a series of rocky pitches where sturdy wooden ladders ensure a safe ascent further up the kloof, eventually reaching a pool at the foot of the final and highest (over 100 metres, 320 ft) waterfall. This is the moment to pull out a flask of tea, coffee or cool drinks and snacks. This easy ‘out and back’ route returns hikers to the tranquil cultivated lawns, ponds and flowers of the Botanical Gardens. The Red Disa Restaurant in the Gardens is happy to provide everything necessary to slake any hiker’s thirst. Sturdy hiking shoes or hiking boots, sunhats and clothing suitable for changeable weather, as well as water, drinks and trail food are essential. Children under 12 free if accompanied by an adult. To book a walk, please contact us.